One of the first things I do before I spend significant money on any product is search the internet for reviews of that product. It might be a physical product such as a computer monitor or a digital product such as a file storage service. One thing I’ve found over the years is that not all product reviews are truthful. Unfortunately, there are quite a few product review websites that give positive reviews to sub-par products. The root of the problem is that almost every product in the world has an affiliate program that backs it. Webmasters join these affiliate programs and receive compensation for every customer that clicks through and purchases a product. Whenever there is a financial incentive to sell products, webmasters will be tempted to write positive reviews no matter what. The more sales these webmasters generate, the more money they make. This can make it difficult for us searchers that are in need of legitimate, unbiased product reviews. The most unbiased product reviews are written by people that have no incentive to sell those products. Two of the most reliable places to find reliable product reviews are discussion forums and the comments section of major websites. Let’s take online file storage for example. 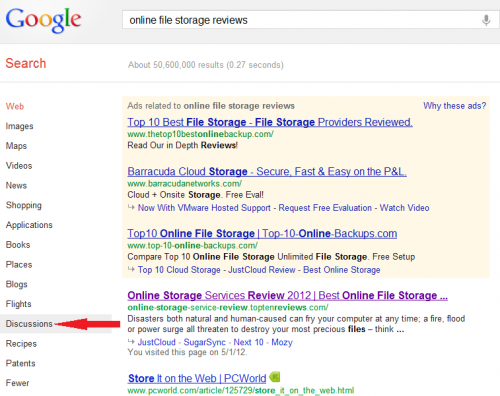 You can search the internet for “online file storage reviews” and find dozens of websites that review online storage services. Some of these websites are dependable, others… not so much. Clicking on this link will change the results to only include discussions related to your term. These tend to be real discussions between real people and are therefore pretty reliable. Note: Remember that you are likely to see more negative reviews than positive reviews when you search for discussions. People who are happy with their products post fewer comments than people who are angry. Keep this in mind as you read through various discussions. If you’re looking for a physical product, you can often find a good number of comments by visiting large websites such as Amazon.com and BestBuy.com. Visit those websites and search for the exact product model that you’re considering. The chances are you’ll find unbiased comments related to that product. Not all review websites are bad. In fact, some are awesome. They will break down the product in its entirety and give you both the pros and cons. The key is knowing how to identify these websites. For the most part, you can tell if a website is trustworthy or not by reading through a few reviews. The writing style will tell you a lot. Trustworthy review websites tend to stick to the facts. They will tell you both the pros and cons of any product. They will also give you hard numbers that you can use to compare various products. Low quality review websites tend to offer more generalities than facts. For example, bad review sites will tell you that a product is “amazing” or “life changing” but they won’t back those claims up with hard numbers or legitimate reasons to like the product. However, it is worth noting that some websites make it a point to only review products that they deem to be of high quality. They don’t even waste your time writing reviews of products that are inferior. But even in this case, the reviews include hard numbers and are willing to note both the strengths and weaknesses of each product.